Rise and Shine, Sinister Sister! Anyone who knows about witchcraft knows that you can't keep a talented witch down for long! Sooner or later she's gonna rise from her long-term dirt nap to seek her revenge! The town of Salem has been too relaxed for too long. They thought that their twentieth-century ways could shield them from the curses of the past. Well, it turns out, there's a reason that Halloween has such a strong pull these days. It's so that the mystical ladies of lore can have a chance to brush off their old broomsticks and have one more crack at spinning up some wicked spells! This colorful enchantress might seem a little goofy but she's got a good nose for magic. While she's got plenty of love for the sister's in her coven, we'd keep the kiddo's well clear. Her culinary cravings trend to whatever is fresh and innocent in the area. This dress is exactly the ragtag kind of garment that you'd expect a home-grown witch to wear. 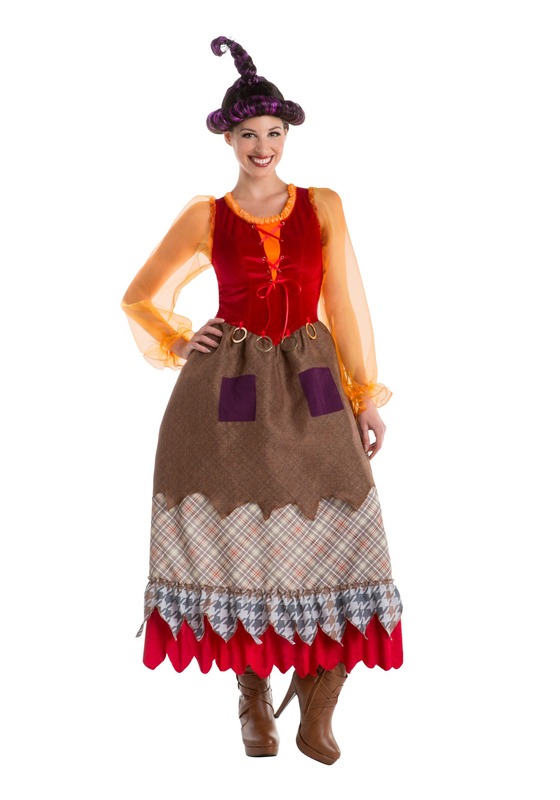 It has a red velvet bodice with a bright orange blouse with sheer sleeves attached. You'll enjoy the layered skirt with metal loops along the waistline that would be perfect for hanging any spooky bags of potion ingredients that you might find with your spooky sense of smell. Top it all off with the wild purple twisted wig and your witchy look will be complete! It's time people learned that just because a lady practices the black arts doesn't mean she doesn't know how to have fun! After all, what's more of a blast then dancing in the light of a full moon? Sure, the morning light might turn this hag (we meen that in a good way, please don't turn us into a cat!) to stone and you would never invite her over to take care of your kiddos but she definitely makes any Halloween costume party more fun! So, head out with two of your nearest and dearest coven sisters and maybe a zombified boyfriend as well and see what kind of trouble you can stir up this All Hallows Eve!